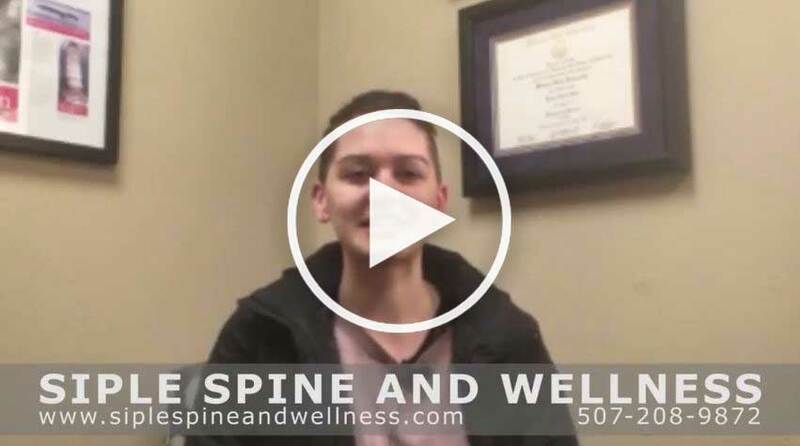 Rochester Chiropractor Reviews from some of our patients. Our Patient's Stories of Hope. You can set your mind at ease knowing there are so many patients who can vouch for the personalized spinal care of Siple Spine and Wellness. “Accidents happen. When I fell and broke my wrist, I also hurt my neck. The wrist healed, but the pain in my neck continued. The neck caused severe headaches, and I was miserable. 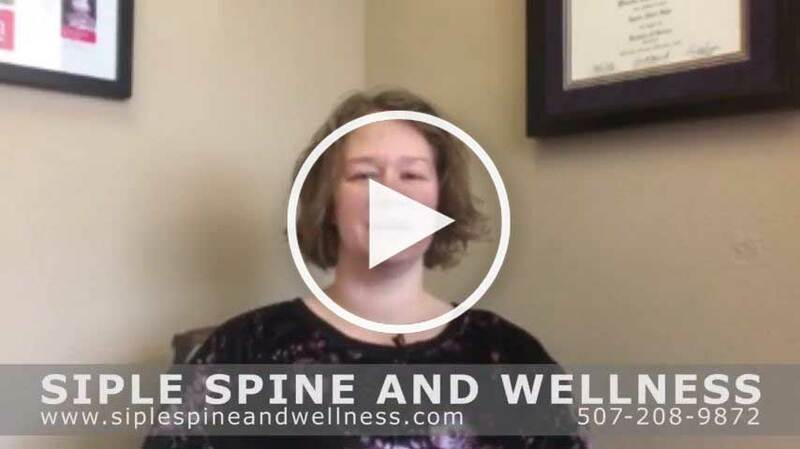 “Siple Spine and Wellness surpasses all my expectations and needs. Instead of frequent adjustments with minimum results from previous chiropractic care, I now receive fewer but more accurate adjustments with superior results. At Siple Spine and Wellness, you are informed on a progressive type of chiropractic care called NUCCA (National Upper Cervical Chiropractic Association), thoroughly analyzed using up to date equipment and measurements, and collectively establish an innovative plan of care based on your needs, goals and health issues. Then patients receive a very calculated gentle pressure adjustment that is highly effective. I was skeptical. But it only took one adjustment to radically change my way of thinking. I have had chronic back and neck issues most of my life. Recently I was training to run my first marathon. I’ve been a runner most of my life and have tried to train for a marathon twice before without success. My back, neck, knees and hips have caused me too much pain when building my weekly mileage. Again, I completed about 80% of my training like the previous 2 times and succumbed to my pain. After being unable to complete a 4 mile run I sought the care of Siple Spine and Wellness from a personal recommendation. I was able to get an appointment within a day. My first appointment wasn’t what I expected. I expected an adjustment and some relief from the pain I was experiencing. But instead, Dr. Justin educated me on his type of care, we talked over my issues and goals, and did an extensive amount of x-rays, measurements and made an appointment for the following day. Frankly, I was a bit disappointed because I wanted something tangible, I wanted pain relief and I wanted it right away. I didn’t know at that time that effective chiropractic care takes an in-depth analyses and specific calculations based on each individual. My second appointment was life changing. Again, Dr. Justin informed me of what we were going to do, we reviewed my x-rays along with explanations and reasons for my pain and discomfort. He was patient with me and answered all my questions. Only after a complete analyses did Dr. Justin perform a very gentle adjustment. It only took 5-10 mins of gentle pressure at a precise location, angle and torque on my neck to give me complete relief. At first I was dizzy and unbalance (due to years of being misaligned). I knew I felt different, but didn’t really know if I felt better until I ran the next day. I ran 10 pain free miles which hadn’t happen in months. After only 3 adjustments, I completed a 20 mile run with minimum pain and discomfort. And after only 5 adjustments I finished my first marathon with a smile on my face. The other two important additives of this care are the savings of time and money. I’m a busy mom of two with a full time job. I watch my time and money closely. Because these adjustments are tailored so closely to the needs of my body, I responded quickly to learn how to hold the adjustments and move while being in line. With other chiropractic care that I’ve received in the past, I’ve had to be adjusted at least 2-3x a week for at least a month or so to get my body to hold the correct alignment. 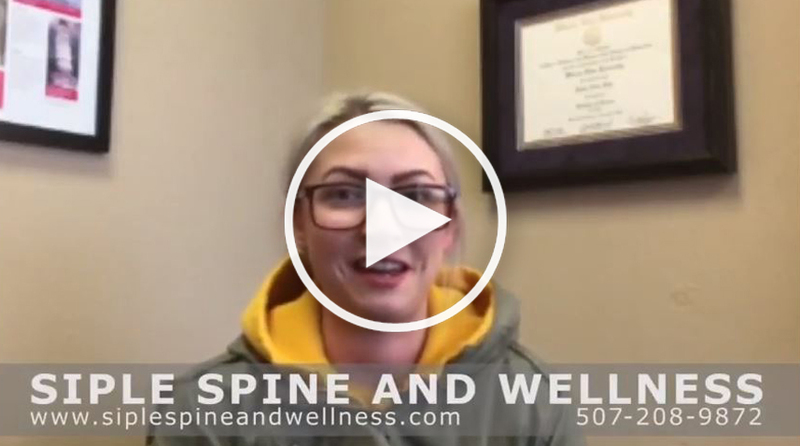 With the care at Siple Spine and Wellness my first week I had two adjustments. My second week I had one. I could skip my third week all together, and only had an adjustment once on the 4th week. I then ran my marathon which I was adjusted the Friday before and went in the Monday afterwards. But I didn’t even need to be adjusted because my body was still in line even through the race. Now, I’m being adjusted every month and a half or so and continuing to build time between my adjustments. “Dr. Siple has made a huge difference in my quality of life. I had a neck fusion approximately 8 years ago and now have significant arthritis in my lower back. I came into his office with a fair amount of concern and skepticism because of my neck fusion at C3-C7. I had also been told do not let any chiropractor touch my back. After talking with him extensively and discussing how the procedure was performed and with his assurance that it would never affect my fusion sites I decided to give it a try. After the first treatment I noticed a huge difference in the tension in my shoulder area with significant relief along with my lower back. After about one month of treatment I am having minimal maintenance treatments. I would recommend Dr. Siple for anyone who is looking for a non-invasive treatment for pain relief. His caring and listening of my concerns lifted any doubts that I may have had about going through his treatments. “I remember hearing about NUCCA adjustments from a coworker. At the time I thought “how interesting to approach chiropractic from the point of proper brain to body connection”. In December I injured my back and after a month of self imposed rest and a regiment of pain pills I wasn’t much better. Having had previous back surgery and not wanting to go through that ordeal again I decided to first make a visit to Dr. Siple. Being in the medical field I was skeptical but willing to work with him. After my first adjustment my back improved and also the constant pain in my knees I had was gone. After a few adjustments I stayed in alignment and didn’t even need an adjustment at my visit. When I became a nurse many years ago the emphasis was on fixing a symptom. I prefer Dr. Siple’s approach of fixing the problem causing the symptoms and then prevention so that the symptoms never return. “I have Parkinson’s Disease and deal with issues like poture, balance, tremors, fatigue and back pain. Even though there is no cure for PD, after seeing the positive affects NUCCA was having on my husband it made me think that if I could keep my spine aligned I would be giving my body the best chance possible to heal as much as it could with PD. After my first adjustment I thought it was amazing that I could immediately breath better, turn my neck with no pain and I actually felt like smiling. For years I have doctored with problems I have with my tailbone from a previous injury. It shifts and twists and makes sitting and lying down very painful. With Dr. Siple’s gentle adjustments it is no longer an issue. And to think I was going to a chiropractor every week for 6 months because it would not stay in place for more than a day or two. “I was in the process of seeing another chiropractor that I’d seen and used for 8 or more years. I was currently dealing with a very painful sciatic nerve and my present chiropractor could not get rid of the pain after many visits. It was still nagging and hurting constantly. I called him, got an appointment, and felt and knew something had changed and was different for the better.